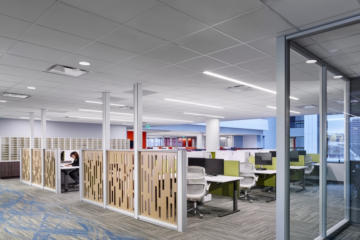 The GSA-BFC relocation project was a multi-story, phased renovation of an existing space. The overarching strategy was to create a much-needed updated look from the previous institutional government space. The expert design and installation team from INSTALL Warranty Contractor Image Flooring LLC used bright colors and an open floor plan to create a contemporary feel. 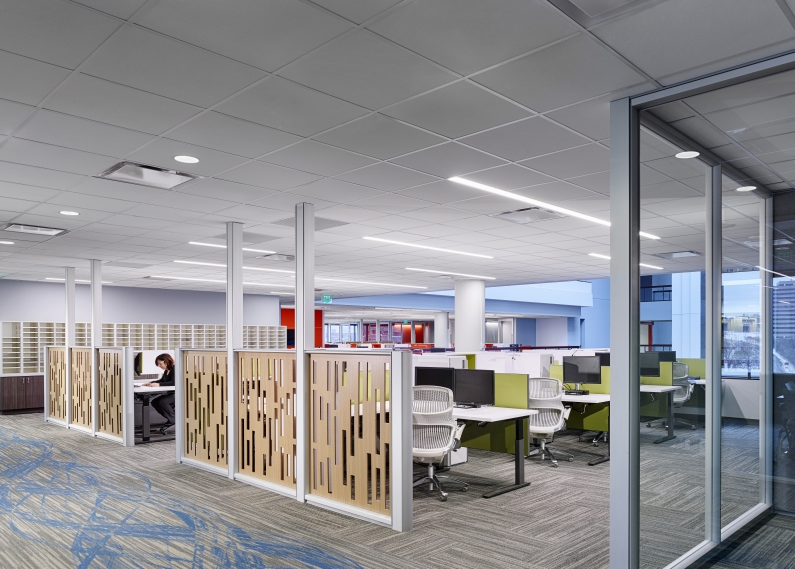 The open traffic areas were designated with energetic patterned 6-foot wide Powerbond carpet. 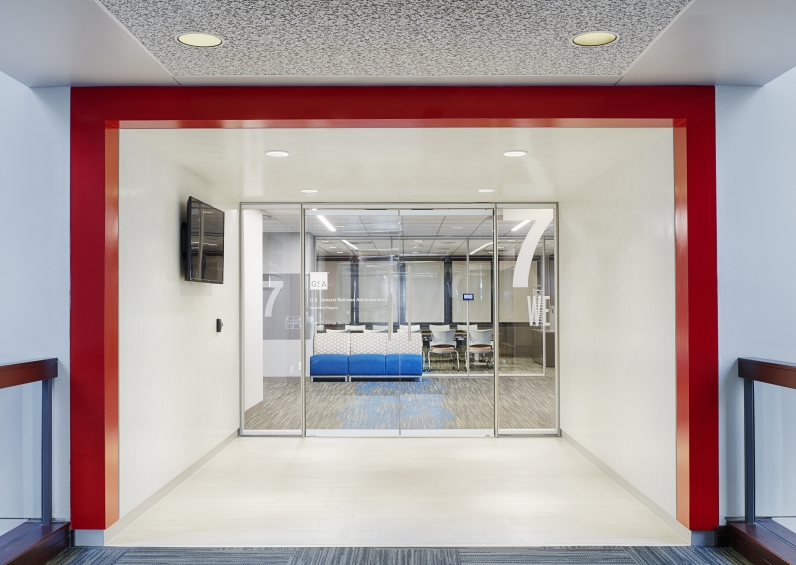 A continuous design element connected to carpet tile on either side and mitered at the corners, creating a unique installation challenge. 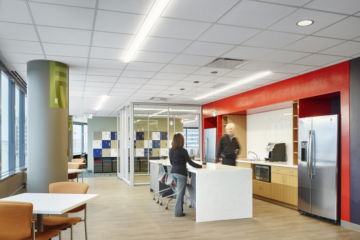 Like many contemporary commercial projects, the GSA-BFC relocation project had tight turnaround times, a fast-paced schedule and a complicated design that incorporated several products and finishes in one, large open-concept space. Every single day that the building would remain occupied during renovation meant increased challenges; limiting space and accessibility, requiring daily accommodations to other trades, and necessitating both early morning and late night deliveries. The project’s November start meant Image Flooring installers did holiday season work to meet final deadlines. A unique and modern product from Tandus, used throughout the space, presented a significant installation challenge. Powerbond is a hybrid resilient sheet flooring product made from the heterogeneous construction of nylon and closed-cell cushion. Heat and pressure fuses cushion and nylon together creating a floorcovering that is integral and inseparable. While the cushion provides obvious benefits in a commercial setting, it also raises the height of the installed floors. 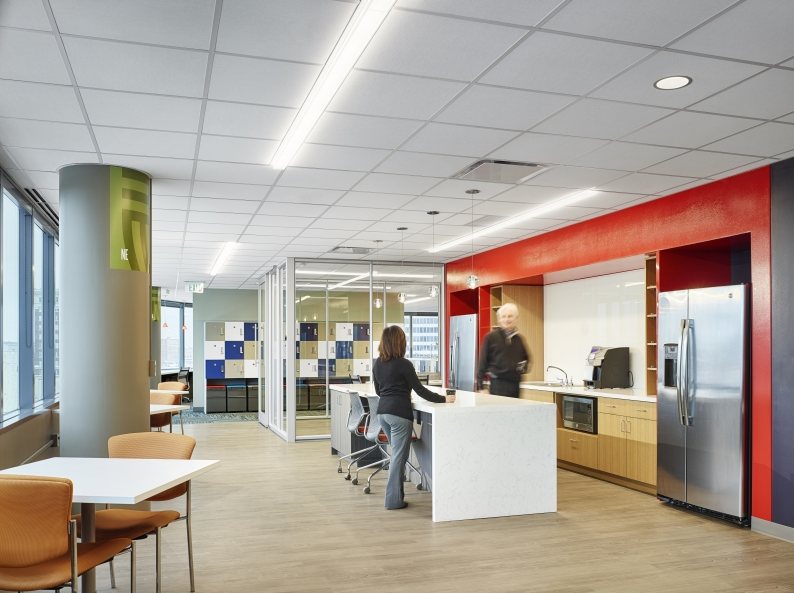 Since the Powerbond product served as a type of “roadway” through the open-concept rooms and spaces, there were thousands of feet where the product came into contact with other flooring types. The primary surface it met was 18×36’carpet tiles. Installed in a herringbone pattern, the carpet tiles were significantly lower than the installed Powerbond product and the transition presented a tripping hazard. In order to rectify the situation, the installation team used gorilla tape to build up the height of the carpet tiles. This improvised subfloor created a seamless and level transition throughout the building. The finished project, which spans several floors and 142,367-square-feet, has completely transformed this dated, staid government building. 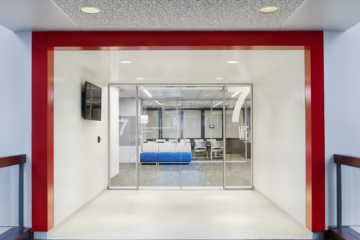 The space features a logical and easy to navigate open space office plan that enables greater levels of collaboration among employees. Additionally, the facility management team can rest easy knowing that the flooring was installed by an INSTALL Warranty Contractor. With an unmatched installation guarantee, the space will stand the test of time, traffic, wear and tear.